You are here because you have probably heard of the countless options for orthodontic treatment and are interested in the virtually invisible way to straighten your smile! Invisalign is the clear alternative to braces. Imagine straightening your teeth without anyone noticing! Dr. Shafer offers Invisalign and more. He is a certified Platinum Invisalign Provider in Champaign, & Mahomet, IL and has treated countless patients with Invisalign. Platinum Providers have achieved an extraordinary level of experience with Invisalign ensuring that your treatment process is only the best. 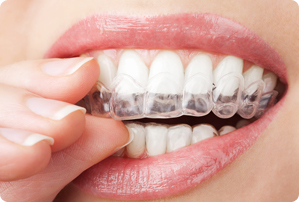 Many people wonder if Invisalign is right for them. Often, patients are told that they are not candidates for treatment, which may not necessarily be true. Why not call today at 217.356.9595 for your Shafer Smile Assessment to determine if Invisalign is right for you?